Ro-Ro passenger ferry Mutiara Persada III caught fire near Pulau Tunda island in Indonesia. 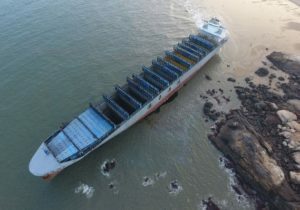 The vessel was en route from Jakarta to Panjang with 116 people, but on the half way the crew raised alarm for fire on board and ordered people to take life jackets and move to deck three. The accident was reported to local authorities and VTS ordered the nearest ship Mutiara Timur I to assist the troubled ferry and to evacuated all the passengers and non-essential crew. The people were accounted and transferred to Lampung, but three passengers and two crewmen were taken to the Hospital Bumi Waras, where were treated with respiratory problems, caused by the smoke. All of theme were released for home treatment without life-threatening injuries. The flames were extinguished by the crew, but total excess of the damages to the passenger ferry is under assessment. The local authorities initiated investigation for the root cause of the fire, but according to preliminary report, the fire started in one of the cars on the vehicle deck. Nearby three cars were also inflamed and burned out. Ro-Ro passenger ferry Mutiara Persada III (IMO: 9004592) has overall length of 151.10 m, moulded beam of 23.00 m and maximum draft of 7.60 m. The deadweight of the ship is 4,124 DWT and the gross tonnage is 15,380 GRT. The vessel was built in 1991 by Saiki Heavy Industries in Japan.